Next to where I am staying in Claremont, there is a cosy little café called The Larder. 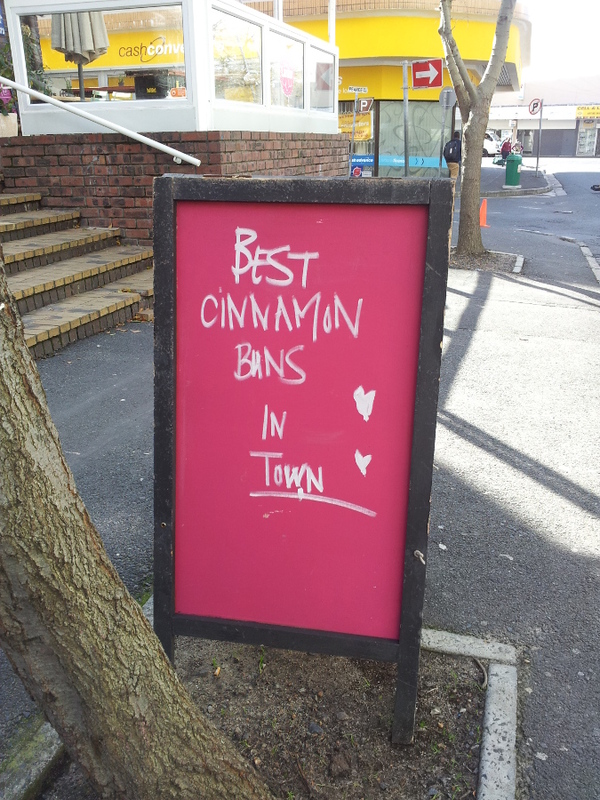 From the outside, it is rather unassuming – except for a bold sign claiming “The Best Cinnamon Buns in Town”. Being from Scandinavia, of course, I had to try one. And I must say – these cinnamon buns were amazing! Made from seasonal, local ingredients, the cinnamon buns tasted just like the ones back home! They were just the right size, soft and flavourful. And on top of that, the price is not bad – only 15 rand (10 rand if you get there early in the morning). I later returned for their Soup of the Day – a warming blend of tomato, veggies, fresh spices and chickpeas – served with a side of sourdough bread. This was enjoyed in the cosy ambience of handwritten menus, inviting couches (with pillows sporting texts like “hello there”) and upbeat 90s music. I rounded off the soup with a cup of soy hot chocolate (made the proper way, with real chocolate). Like the food, the hot chocolate tasted great! The Larder is on Grove Avenue, only a stone’s throw from the Cavendish mall. The Larder also has a Café in the Block and Chisel furniture store, Diep River. If you’re ever in Cape Town, take the time to visit this hidden gem. It is definitely worth a detour. Early bird breakfast with hot chocolate instead of coffee and an extra cinnamon bun – 50 Rand and worth every cent. In the Mornings, The Larder is bustling with people from all walks of life. If you are looking for a bit of peace and quiet, stop by in the early afternoon. The Larder also has a café in The Block and Chisel furniture store in Diep River. At the café in Diep River, you can knit scarves for charity.